Olympic philately was born in the same time with the modern Olympic Games. Formation and development of the sport philately is closely intertwined with the genesis of the Olympic movement. Let's see how this development was happening, calling attention to some editions of the Olympic stamps. The reason for the publication of a series of twelve stamps with eight subjects were actually the financial problems, which arose before the organizers of the first Olympic Games in Athens. A series of stamps has five subjects, connected with the Olympic Games in Olympia (the relief of the pedestal of the Polidam statue, a sculpture by Myron - "The Discus Thrower", the Quadriga, the sculpture "Hermes with Dionysus" and the sculpture of the goddess Nika by Peonies). One story is related to the Panafinean games (panafinean amphora was a prize for the winner of the game), and two stories - to the modern Games in Athens (the stadium and the famous Acropolis). Sketches for those stamps were created by the French Professor G. Gillieron, who at that time was residing in Greece. The prints were produced from his drawings, by Professor's compatriot - the famous engraver E. Mushon. Director of the Numismatic Museum in Athens, Professor A. Svoronas, was a consultant in a selection of subjects. The stamps were printed in the governmental printing house in Paris. This team of artists has created not only the items of a decorative art, but also the wonderful works of the graphic art. For the first time on the graphic miniatures - postage stamps - there was vividly embodied the community of sports and art. Stamps went to the circulation at the very opening of the Games, not on the second day, as it is erroneously believed by many authors. Thus, the philately has become a source of Olympic education from the first day of the modern Olympic Games. There have been created a special conditions to provide this. By the Royal decrees, the payment of all correspondence - starting from March 25, 1896 up to March 31, 1897 (by the old style) - was made only by the Olympic stamps. After that, those stamps were deprived of all privileges and were used in the postal services along with all the other stamps. Stamps were printed in amounts from 52,200 to 4,000,000 copies. At that time no newspaper could be compared with the stamps in terms of circulation. The boundaries and distances did not matter, mail could reach the most remote and inaccessible corners of our planet. Information was reaching the press for a very short time, but with the help of philately this process lasted for four years - until 1918. 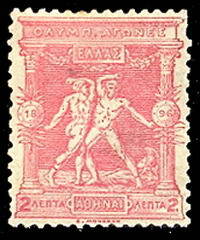 From 1861 until the 1896 - Olympic Games in Greece - there were only issued stamps with the image of Hermes's head. New subjects of the Olympic stamps instead of a monotonous series of images of Hermes were increasing the effect of visual perception - the main thing in art. The sharp change of subjects unwittingly has drawn the attention to the cognitive side of the new stamps, that were giving knowledge not only about the ancient Greek Olympics, but also about the modern Games. On those stamps there were printed the name, the place and the year of Olympic Games. All this allows us to say, that at a very early stage of the development of Olympic Games, philately was the main source of Olympic education. Special hand- and machine stamps of the exhibitions of 1900 and 1904, and their absence in honor of the Games emphasize the role of exhibitions and the Olympics. The Games were only a part of the entertainment program of those exhibitions and they were represented by a series of individual competitions that were held for six months. In 1906 there was a 10 years jubilee of the first modern Olympic Games. To commemorate this anniversary, in Athens there were organized the extraordinary Olympic Games. To commemorate the extraordinary Games in Athens there were printed a series of fourteen stamps with nine subjects, that are taking us back to the Olympic Games of antiquity. 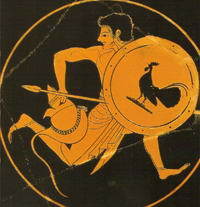 Each miniature was a reproduction of the ancient Greek works of art or reproduced some scenes from the Greek mythology. The original copies of those stamps are until now preserved in the museum collections all over the world. On the first two stamps there is depicted Apollo, throwing the disk. This subject is taken from the silver tetradrachms of the island of Kos (455 BC). The next two stamps are depicting a jumper with the dumbbells. Two miniatures are dedicated to the winged goddess Nika. One subject is taken from a silver coin of Tiruni and the other is borrowed from the ancient works of the certain genre. In the series there are also stamps, who's mythological stories are well known. These are the postage stamps for 20, 25 and 50 lepta. Two of those stamps are depicting the culmination of one of the labors of Hercules - stealing the golden apples from the Hesperides. In the third stamp there is depicted a fight of Heracles with Antaeus in Libya. Three stamps dedicated to the long distance running. The drawing was taken from the Attic amphora. One of the miniatures is dedicated to the Pankration. The plot of the drawing is taken from the copy of a marble sculpture of the IV century BC, that is kept in the Uffizi Gallery (Florence). The subject of the last stamp was the ceremony of sacrifice in honor of the Games. This series significantly expanded our knowledge about the ancient Greek Olympics. Circulations of those stamps were slightly higher and ranged from 102,500 to 4,505,000 copies. According to the Royal decrees, from March 25, 1906 until March 31, 1907 at the post offices there were accepted only the stamps of Olympic series. At this time, the series appeared in the post offices 15 days before the Games, which was contributing to the improvement of their advertising. The Greek Mail shared the experience of the use of a special hand stamps at the World Exhibitions, and pioneered the use of three of those stamps. By these stamps there was quenched the correspondence at a stadium in Zappeion and also at one of the buildings of the Acropolis. On the stamps and on the postmarks there was written "Olympic Games". The postmarks were used in the days of the Games, and in Zappeion - also within three days after. Stamps at the post offices were actively used until 1911, and at the least extend - until 1919. Information about these Games in the press is very stingy so far, so it can be argued that the main source of the information was again the philately. Olympic Games IV were held in the framework of the Franco-British Exhibition. Again, there was repeated a pattern of the Games in Paris and in St. Louis. British postal administration issued two special hand-held round postmarks of the exhibition. Another postmark with the text: "Stadium / Franco-British Exhibition" for some reason did not appear in the circulation. A few photoprints from the date of July 9, 1908 are still preserved in the archives of the UK Post Office. The next Games were held in 1912 in Stockholm. About 300 special forms of telegrams with the images of the stadium and the text: "Stadium / Stockholm / Sweden / Olympic Games / June 29 - July 22, 1912" and "Employees of the Stockholm telegraph are addressing all their best wishes for the New Year. January 1, 1912" - were sent as New Year greetings. At the initiative of the National Olympic Committee of Sweden at the Stockholm Post Office for the first time there was used a special machine postmark with the text: "Olympic Games in Stockholm / June 29 - 1912 - July 22" in Swedish and English languages simultaneously. In Gothenburg, on the correspondence to the USA and Canada, there could be seen a transit advertising postmark with the text: "The Olympic Games / Stockholm 1912/29 June - 22 July." Both postmarks were used from March, which gave enough information about the upcoming games in advance. Promotional postmarks were rarely used at that time, and they were immediately attracting attention, and the presence of a special text only increased their visual perception. They were placed on all correspondence, that was sent from these places. Especially many items were sent in a few months directly from the post office. In the post offices, located beside the stadium, there were used two postmarks with the text: "Stockholm/Stadium" and the label for the registered items with the same title. Serial number of the Olympic Games "V" first appeared on the official mailing envelopes at the Organizing Committee of the Games. From May 1910 until July 1913 by the Secretariat of the Organizing Committee 87,676 of these envelopes were sent to many countries all over the world. No stamps were released at this time, but still there was a lot of versatile information about the Games. Philately became one of the leading sources of the world wide Olympic education.